Laval (Quebec), February 4th, 2016 - The Ampak Group is proud to work with its customers in order to meet the challenges of the packaging market. 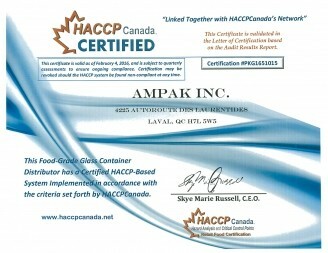 Ampak Inc. has been granted the international standard H.A.C.C.P. for its factories Ampak Plast Inc., Ampak PET Inc., Reaction Packaging and Multicap Inc. They all comply with industry standards. Ampak catalog; a picture is worth a thousand words. 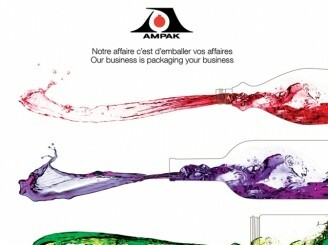 Ampak has just launched its new product catalog. Offered in both printed and electronic formats, our new catalog fully showcases our various bottles, jars and other packaging solutions. The catalog, available as an electronic download here, is filled with over 90 different products, each available in various sizes, shapes and finishes. Our products are clearly identified as plastic, glass wide mouth, glass narrow neck, closures and custom products. Our new catalog also includes an interesting Ampak company profile and an overview of our custom capabilities. To request your own catalog, please use the “Request a catalog” form at the bottom of the electronic catalog. The new Ampak.ca is now online for your browsing pleasure. Ampak is pleased to announce the launch of our new Ampak Group website. 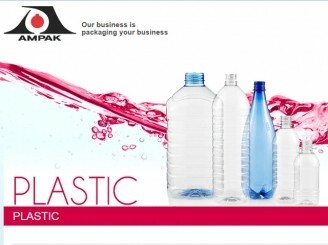 The new website features our entire collection of plastic, glass and other packaging solutions. Moreover, we have included important and practical information as well as interactive features such as our Glossary 360, our virtual tour, production information, videos, news, careers and much more. The new Ampak.ca website truly showcases the high quality and availability of our packaging products throughout North America. Browse our website and find the product that best suits your needs or contact us if you require a custom packaging solution.